Eleven days before Mt Tarawera erupted a number of people reported a disturbing sight: a ghostly, fully-laden waka (canoe) being paddled across Lake Tarawera, in the shadow of the mountain. The sighting was widely discussed, and received much attention from artists and writers after the eruption, but has never been satisfactorily explained. 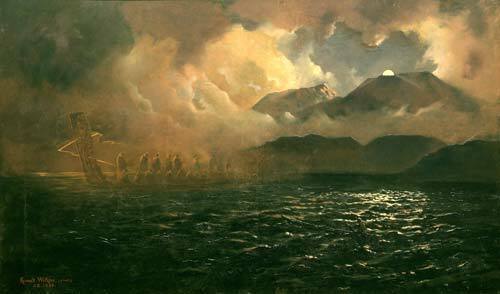 This 1888 painting by Kennett Watkins shows the canoe in a dramatic evening setting, illuminated by the rising moon.